Have you walked past a memorial, not realising what it was? If you are ever in Oamaru, you might notice the beautiful oak trees lining the streets. What you might not know is that each of these trees was planted in memory of someone who fell during the war. Prior to the war an oak had been planted for Captain Robert Scott and in 1918 the Oamaru Beautifying Society decided that an oak should be planted for every fallen soldier as a grand memorial gesture. This was common after the war; all over the country there are large scale memorials in many unique forms. The first tree in the scheme was planted for Donald Forrester Brown, the second New Zealander to be decorated with the Victoria Cross. Right next to his is the tree commemorating Nurse Isabel Clark, whose is name is misspelt as 'Isobel'. Isabel was eager to help when war broke out. 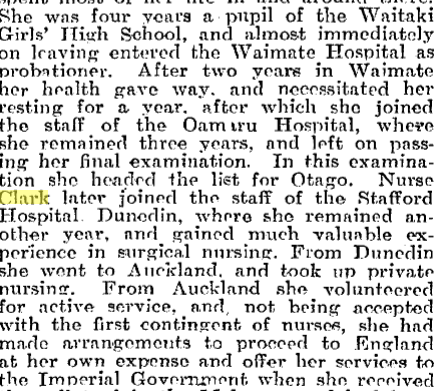 She resigned her position working in a private hospital in order to enlist and was one of the first nurses to leave New Zealand. Isabel lost her life when the transport ship she was on was sunk by a German submarine. When the ship was struck, one of the surviving nurses on board watched as Isabel and her best friend Nurse Marion Brown held hands and jumped from the ship into the water, never to be seen again. You have been given the town map showing the plan of the Oamaru Oaks. This map showed how the town chose to honour the soldiers who fought but didn't return. You are now tasked with discovering more of the story behind Isabel Clark. How much of his story can you piece together? The suggestions below will help you on your research journey. The How We Find It Fact Sheet will also be a helpful tool in helping you discover the pieces of Isabel's puzzle. 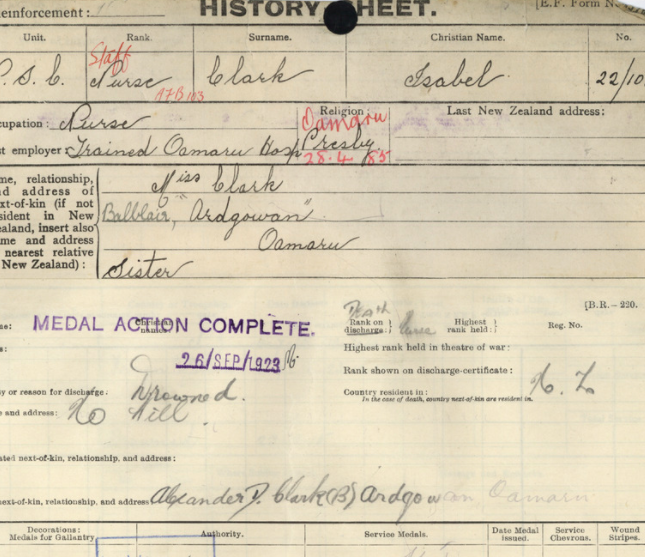 You're in luck, Isabel served in the New Zealand Army and so his records will be able to be found online at the Auckland War Memorial Museum Cenotaph. This is your most important search. Collect as much information as you can. Once you've found Isabel's Serial Number move to Archway and search for his service documents there. Obituaries in Papers Past often give us a lot of clues about a person - including their life and schooling. Use Papers Past and the phrase 'Isabel Clark' to search for Isabel's Obituary. This obituary tells us about her parents, her schooling, her health and her nursing career. Use each clue from the obituary to do further research online - (e.g can you find evidence of Isabel at Waitaki Girls' College?). what happened on the marquette? Ten New Zealand nurses, including Isabel Clark, drowned when the Marquette was torpedoed on 23 October 1915. The Marquette was not a hospital ship, marked with a red cross, so it sailed without the protection of the Geneva Convention and was therefore fair game for German submarines. Use Papers Past to find out how the Marquette sinking was reorted in New Zealand. find memorials in new zealand dedicated to women who served. Sixteen New Zealand nurses lost their lives during the war. In addition to the 10 who perished when the Marquette sank, Ada Hawken, Lily Lind, Esther Tubman and Mabel Whishaw died of sickness. Ella Cooke, who nursed with the French Flag Nursing Corps and the QAIMNS, was killed by a train in Egypt. Elise Kemp, serving with the British Territorial Forces Nursing Service, died in an air raid in Flanders in October 1917. She is believed to be the only New Zealand-born nurse to lose her life on the Western Front. At least five other nurses died later as a result of their war service. Use NZ History to find memorials, gravestones, chapels and school rolls of honour in New Zealand that are dedicated to these women. how did dr alexander douglas first describe his idea for the largest war memorial in new zealand? Dr Alexander Douglas was the Port Officer of Health. He spoke with local Headmaster, Frank Milner, of Waitaki Boys High School about an idea he had for a huge war memorial to the fallen soldiers of North Otago. This war memorial would go on to be planted in 1919 and is the largest war memorial in Use Papers Past to search for the term 'Dr Alexander Douglas' and to find how Dr Douglas' idea was described to the people of North Otago. ISABEL SHARES THE CENTRE OF THE WAITAKI OAKS WAR MEMORIAL WITH ONE OTHER SOLDIER - WHY IS HE AT THE CENTRE? The Memorial Oaks were planted in 1919 in the form of a wheel, the hub being in central Oamaru, and radiating out into the countryside. The trees, with plaques, and latterly crosses, are on many Oamaru streets and further afield. Where possible, they were planted close to where the dead were from - at entrances to farms, outside houses, or in the case of James Campbell Lumsden, outside their place of work. Who does Isabel Clark share the centre with (marked in red)? Use Papers Past to search for his name and read about what he was awarded during the First World War. Discover why he is at the centre of the Waitaki Oaks Scheme. Use Google Maps in Satellite view to examine trees outside of Oamaru township that could also form part of the scheme. Isabel Clark and Donald Forrester Brown are at the centre of the Waitaki Oaks Scheme, New Zealand's largest war memorial, but there had been a memorial oak planted by the before these in 1913 by the man who conceived of the scheme. Dr Alexander Douglas was port officer of health for Oamaru when the ship Terra Nova arrived back from its ill-fated Antarctic expedition with news that Captain Robert Falcon Scott and his party of four had died on their way back from the South Pole.The local doctor was sworn to secrecy while a telegram of the news was sent from Oamaru Post Office to London on February 10, 1913. But Dr Douglas, who was president of the Oamaru Beautifying Society, decided to honour Captain Scott by planting a memorial oak tree in Arun St, overlooking the harbour. Who was Robert Scott and why was his death such a shock to the world? The Memorial Oaks Plan is connected with the story of Isabel Clark who attended Ardgowan School and Waitaki Girls' High School.The original plan is held by Oamaru North Museum. This story is told with the permission of Hugh Catto, on behalf of the Clark Family. The Walking with an Anzac Team found the first clue in Isabel's story when they visited Waitaki Girl's High School. Isabel's name features on the Ardgowan School Roll of Honour - a stone plaque at the school entrance. Further research on the same platforms you have used today allowed us to discover Isabel's Story. Research starting points for Isabel's Story. Lord Jellicoe on the memorial oaks plan.